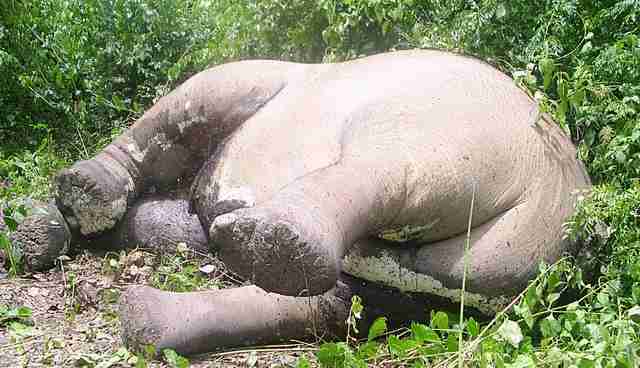 A 10-year-old wild male elephant was found dead in India on Thursday morning. Tragically, he had starved to death - and the likely reason was man-made: pesticides. The juvenile was spotted days before his death lingering on the edges of a forest area in Mankarai. A herd of elephants was seen guarding the sick pachyderm and attempting to feed him, but sadly, he was too ill for his friends or family to help him. Forest officials deduced that his mouth was covered in ulcers, which were likely caused by eating fertilized crops, a conservationist told the Times of India. In India, it's common for elephants to eat local crops for sustenance. Officials reportedly tried to throw the suffering animal some fruit, in lieu of veterinary care. Any last-ditch effort to save the elephant was shelved when a heavy downpour hit Wednesday night. The animal appeared to have perished in the early hours of Thursday morning. Pesticide use on crops in Asia is widespread, says Simon Hedges, Asian elephant coordinator at the Wildlife Conservation Society. Hedges told The Dodo that elephants often eat staple crops like rice and cassava, pineapples, banana and palm oil from industrial-scale plantations. Altogether, Hedges believes potentially lethal pesticide accidents appear to be on the rise, as well as deliberate poisonings of water holes or grain or fruit by farmers who retaliate "for crop depredations and other forms of human-elephant conflict." Potential pesticide culprits include organochlorine, organophosphate and carbamate pesticides (you can read recent scientific studies on pesticides in Asia here and here). Some of the debilitating potential side effects to the elephants include damage to the animals' nervous systems, impaired ability to walk, limited ability to eat and inability to digest food - which can lead to chronic wasting or starvation, explains Hedges. This is most likely what happened to the juvenile in India. Hedges explains that the issue of pesticide-induced mortality in elephants is not only saddening, it's quite serious, given how critically endangered they are. 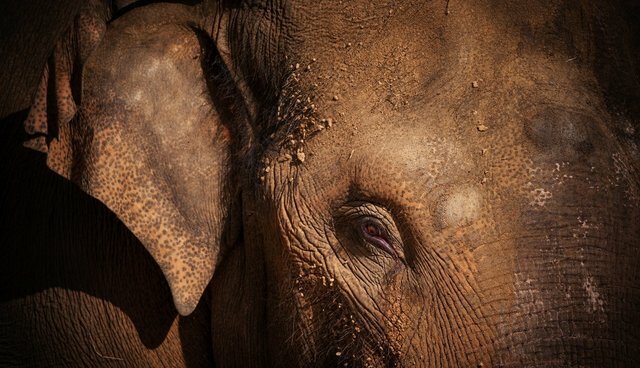 "Asian elephant populations are very often small and isolated," he points out. "The impact of such poisoning events on population viability can be severe."